I love a good quote. Who doesn't? It works on a couple of levels. Of course it is the message. Whether life affirming or personal, a well chosen saying bears looking at on a daily basis. Then there is the design element. We spend so much time looking at letters through the day, in emails, texts, books, work and so on, that we forget how decorative it can be. Back in the day, skilled artisans would create beautiful titles for book covers and pages. We marvel at them in museums now and are thrilled if we find something at an antiques fair with beautiful text. Now, decorative text is firmly in the public domain. The combination of the message and the look makes for great design in the home. We have been creating quotes stencils for years and their popularity never wanes. We have a service called "In Your Own Words" where we can make up your desired quote in a selected style and size. But did you know as also have a range of Proverbs & Quotations stencils ready made? We have just added a few new ones and this gardening themed stencil, LD20, is one of them. the quote is by Dorothy Frances Gurney from her poem, "God's Garden". As a person who loves being in her garden, I think this is particularly appropriate. Stencilling outdoors is a great idea because it will be there all year round. So when the garden is looking muddy and dormant in the winter, you can still have something nice to look at. Make sure any stone surface is clean from flaking material, dirt and moss and is completely dry and clean when you stencil. You can use masonry paint or even acrylic paint. Refurbishing furniture is particularly satisfying. Old furniture is usually very well made but over the years may have been bashed and battered and ended up in the local charity shop. If you are willing to put in the work, then you can purchase a bargain and make something quite unique and new looking from it. Remember to give the piece a good sanding to remove any built-up grime and the first layer of old varnish. This is so your paint will key to it properly. If you suspect it is a waxed piece, you may need to sugar soap it. Then repaint with a water-based emulsion or latex paint (better to stencil onto). Stencil a pattern and then varnish to protect it. This is a weekend project and you will get a great sense of achievement from it. You will also have rescued a solid piece of old furniture, probably with a great shape. This large octagonal side table is a case in point. It has a lovely shape and detailing but had definitely seen better days. Some paint and stencilling and it looks completely different and new. We have used SIB3-M Leaves from our Stencil It section on the site. It is a useful sheet of leaves that you can piece together how you want to create different configurations. We have finished off with matte varnish so it doesn't look varnished at all. When it comes to defining the age of things, more often than not, we use style names rather than years. For example, it might be gothic, or rococco or georgian. And within those styles, there is a look combined with decorative elements and colour that is inherent to that particular style. Whilst this is handy for organising and describing things, it can subconciously limit us. Now we live in an era where nothing is new and we can only reinterpret the past. It is actually quite an exciting time in terms of fashion, decorating and architecture for just that reason. Now someone is exciting not because they have necessarily come up with something completely new, but they will have a unique take on reinterpreting and mixing the past so that it looks new. But to bring it back to decorating: I cannot tell you how many times I have heard someone say, I live in a "...", describing the era of their house, "so I can only decorate in....". In some cases, that may be true, but in most cases, it certainly does not have to be the case. You can do what you like. And you can reinterpret the past in your own way. We have stencilled the wall here in DE87 Repeat No. 21 from our Arts & Crafts range of stencils. Arts & Crafts was a movement that took place around the turn of the last century into the early 1900's and it came about as a direct reaction to the industrialisation of the victorian age. It was about a return to artisan made from natural materials so a lot of wood was used, the subject matter was usual nature based, the colours were earthy and natural: ochre, sienna, terracotta, dusky greens and blues...... As a decorative style, it is quite beautiful and one that is still quite popular today. Patterns from the early 1900s are still being produced. Certainly, our Arts & Crafts range is one of our most popular. If you love the look, never think you cannot use it if you don't live in an arts and crafts home. It is easier for us to define most of our designs by historical era and for those who want to find historical designs quickly, but these are just designs or patterns. How you use them is up to you and you can certainly take them out of context if you like the design. We have stencilled this design in very non-arts and crafts colours. It is matched (or mis-matched) with a Louis style chair and modern chest of drawers. I would imagine this is a modern home. It all looks great and works well together and no, the design gods have not shrieked in horror. Folk Art is a broad term to describe a style that is stylised and naive, usually hand applied, and an early decorative style (although it is also used to describe modern artisan products). It is a hard style to pin down as there is European folk art and American folk art and one probably influenced the other, but the thing that ties them together is that it was generally art created by laborers, peasants or tradespeople in their own homes, so not, originally, something that was created professionally (hence the naive style). But that is what makes it so appealing. It is a humble art. This was created to make homes and furniture more appealing. It's wonderful naive style was borne out of lack of training, just pure artistic talent and vision. Is it any wonder that antiques with original folk art painting from 200-300 years ago command high prices. It is a style that has heart and warmth and lends itself well to any home. Traditionally, it would have been painted in primary colours, but of course we have the freedom to get a bit more creative. We have gone one step further and taken a flower in planter motif and created an allover repeat patter from it. The square repeat adds a certain abstract quality to stencilling when repeated. This stencil is AM61 Pennsylvania and it is found in our new Folk Art section of American inspired stencil designs. The stencil on the floor is VN22-L Tudor (large size) from our Vintage range. Pattern overall (no pun intended) is good in my mind, but then there are some patterns that are excellent. This is a case in point. I love everything about this: the pattern and the combination of cobalt blue, sky blue and gold. It is rich and opulent and just beautiful. You have to like pattern and colour to want this, but if you do, this one is a winner. We have done this stencil, a tile pattern, OTT57 Tile No. 12, on a wall, but it would work on floors and fabrics as well as furniture. It was just too good not use on the walls. This is a new Ottoman/Persian/Moroccan tile pattern made up of geometric shapes. It looks spectacular done in these jewel tones, but it can be done in a single colour and in a more subtle way. It does not have to cover a whole surface and you can just cover part of the area. Really, I am waffling because this picture says it all. This stencil is part of the tile section of our Ottoman range of stencils (which includes Persian and Moroccan patterns). 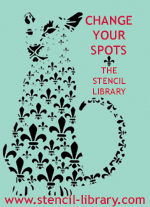 I have been working at The Stencil Library for over 25 years and this stencil has been in the range for about 20 years. I have always thought it the most underrated stencil we have. It is exactly the same format and layout as our polka dots stencils. Only with squares. But for some reason, people don't notice the squares version. We probably sell the polka dots 100:1 of these. But it has a certain elegance for being square. The dot has many positive attributes, but this is, in my mind, more sophisticated. This stencil is MD45 Squares No. 1. It is part of our Modern Design range and comes in 4 sizes. With each size, not only does the sheet size enlarge but also the scale of the pattern. This is the Large size (MD45-L) and it has a square size of 1.75cm which is about 0.75 inches. To me, the small and medium are not so interesting, but the large and xlarge are. I think they work in any room with any style of decor be it traditional or antique or contemporary, just like the dot. But whereas the dot is more fun and playful, this is more grown up. They also work in any colour. We have gone for strong black here, but you cannot go wrong with a metallic. This is a design that puts pattern into the room, but will always be subtle. This is a complimentary design. You can have other pattern, even bold pattern, and this will quietly work with it (not compete). So versatile and very underrated. A couple of years ago, one of the big promoted trends in interiors was copper. Everything that would have previously been made in silver or gold was suddenly being manufactured in copper so we had mirrors, kitchen utensils, lighting, fabrics and more, all in copper. The thing is, copper, as a metallic colour is vastly underrated. It has warmth. It does come in different shades. We have, as metallic stencil paints, Metallic Copper which is more red and Metallic Bronze (as shown) which is more orange. We also have Burnt Orange which is more orange still. We have shown it here on a black wall for maximum impact. The stencil design is FR7 St Germaine from our new French Inspired stencil range. The great thing about metallics is that their reflective quality means the light bounces off them so they change with the light. They are also quite neutral. But next time you are unsure of either gold or silver and cannot decide, consider copper. It may be just the answer. Canvas floorcloths are easy to make and allow you to create art for your floors. Get some heavy duty artist's canvas, paint both sides with a matte emulsion or latex paint (to stop the fabric from warping) and then stencil it with your chosen design. When finished, protect with several coats of varnish. They are then wipeable and can roll up for storage if needed. And when you fancy a change, just repaint and stencil them. There is a product called Roc-lon on the market in the US (for other countries blackout roller blind fabric is not a bad substitute although lighterweight) which does not fray at the edges so you can simply cut the size and shape you need and do not need to worry about folding and gluing the edges,which you would need to do with a standard canvas. Even though the idea of a painted floorcloth sounds a bit traditional, of course, like any surface you can stencil whatever pattern you want. Here we have gone for a wholly contemporary look with the small size of our MD86 Cubes repeat from our Modern Design range. A bespoke floorpiece always looks impressive and there is nothing more satifying than getting creative yourself. On a related note, if you live in a rented property and cannot touch the walls, these are great ways to a) get some pattern into the room and b) protect those rented floors as well. If the purist look is not your thing, then you are person who likes to mix and match styles. This is usually an intuitive look. You just know what mixes well and what doesn't. But one of the keys to successful mixing in decorating is usually a nice contrast. Too close and it looks like you tried to match but missed. Better to have a larger difference in looks. Here we have taken a French style, old country curved chest of drawers, but it clashes nicely with sleek modernist vases. With the stencilling we have done the same. Both are from our new French Inspired range of stencils. We have used FR13 Scroll Repeat on the drawer fronts and FR41 Trellis in the small size on the walls. There is a pleasing contrast between the angular diamond of the trellis and the soft curves of the scrolls. This is such a simple effect but supremely effective decorative finish. The concept is straightforward. You paint your walls in a matte water based paint colour. You then stencil in nothing but a clear acrylic (water based) gloss varnish. This changes the tone slightly. Light plays a part as it will bounce off the gloss finish more than the matte. It is very subtle, almost textural. And it works incredibly well. Here we have stencilled JA45 Mokko, a repeat pattern from our Japanese stencil range in gloss acrylic varnish onto matte black painted walls. The result is stunning. It will work with any colour, pale or dark. We spend a lot of time showing you stencils on walls and sometimes fabrics and floors, but mostly on walls. However, stencils can go onto anything that paint will go onto. So it would follow that, yes, you can stencil furniture. But it can go even farther and you can stencil other accessories. And you don't have to stencil anything else in the room. In other words, if you had wanted to make a plain lampshade more interesting and unique, you could simply stencil this, but leave the walls plain. The choice is yours of course. Sometimes, it works just to put small bits of pattern into a room. The stencil we have used here is the excellent and versatile, slightly abstract, JA52 Waves from our Japanese range of stencils. It appears in two of our other rooms, on a table in one and on the wall of another. Introducing our Foo Dog stencil and how to decorate a cushion with it. We have great pleasure in introducing our Foo Dog stencil, it is an exclusive design for our readers and social media followers. One day it will make its way to our Stencil Library website but for now, they will be a bit of a rarity. But you, dear reader, can order them now, before anyone else. Details of the stencil and information on how to buy will be in the comments section below this post. All the paints and brushes are available from The Stencil Library and the plain, cotton cushion cover came from IKEA. Read on to follow our stencilled cushion project. Paper, this should be cut to a size to fully insert into the cushion cover. A spray repositioning adhesive. We use Spraymount by 3M but are unable to supply it by mail, get it from art or office suppliers. A stencil brush for every colour used in the project. I used four brushes on this one. If you buy our double ended brushes they work out to be cheaper than ordering four individual brushes. Paints of your choice. I used Burnt Umber and Phthalocyanine Blue mixed together, White, Naphthol Crimson, Pearl Turquoise and Pearl Magenta. The two pearlescent colours are not essential, I just like to add a bit of sparkle. However, you can use any combinations of colours that you like. All the paints used in this project can be ordered from The Stencil Library. The cushion cover should be dry, laundered and ironed before starting this project. Fold it into four equal quarters and make a crease along the inner edges towards the corner so that when unfolded you will see a cross made from a horizontal and a vertical crease. Spray a light, even, misting of SprayMount over the piece of paper and after a few seconds insert it into the cover and smooth the fabric onto the slightly tacky paper. This will stop the fabric from shifting when it is stencilled. The paper should nearly fill the cover. Then apply a mist of the spray onto the back of the stencils. Do not overload with adhesive. My technique is to press my hand onto the back of the stencil a few moments after applying the spray. The stencil should stay stuck to my hand for a few seconds only before falling off. You just need a similar stickiness to Post It notes. Place stencil no1 so that the outer edge lies along the centre line at the desired height on the cushion cover. Remember that you may be adding a decorative box underneath the foo dog, so, adjust accordingly. Now stick a length painters tape under the bottom of the stencil extending to the other half of the fabric. This helps you get an equal height for the matching image. Tear a few small pieces of tape and press them onto the fabric directly under the four diamond shaped registration marks cut into the stencil. Pour a little paint onto a palette and dip the flat face of the brush onto the surface of the paint, you need very little paint. Now, stir the brush in a circular motion onto the paper towel this will distribute the paint right across the bristle and dry the tips so that the paint is damp rather than wet before you apply it through the holes in the stencil. Apply the paint with the same stirring motion. The fabric is being held in place with the tacky paper so it won't move when the paint is applied. Start by stencilling the darkest shade onto layer one of the four overlays that complete the foo dog. In this instance, it was the Phalo Blue mixed with a little Burnt Umber. Put some paint or pencil through the registration marks onto the tape before removing the stencil. Once the first layer is removed the paint should be dry enough to position stencil layer two. The registration marks should align exactly with the ones on the tape. Decant some of the original paint colour from the first layer and add white to it. Test the two colours on paper to make sure that the tonal difference can easily be seen but is not extreme. Lighten and brighten the original paint mixture even more and apply stencil layer number three to add the highlights on the Foo Dog. This is when I added touches of the pearl turquoise to add a bright shimmer to the colour scheme. It will not ruin the effect if you omit this extra shimmer, but it does improve it if you do. Complete the image by stencilling layer 4 in the same colour as the first layer. If you are adding a background stencil you do that AFTER you have stencilled the foo dog image. My dear friend Holly tells me that Foo Dogs or Foo Lions should always appear as a pair. So, we will stencil a matching partner. Now, flip the stencil over and apply the spray adhesive to the other side. Position the foo dog to mirror its partner by lining the edge of the stencil with the tape and the centre crease just like you did with the first one. Repeat the process of stencilling all the layers. Now you are ready to stencil the boxes underneath the dogs. In my pictures, I have made the box shape with tape, but since I completed this stenciled pillow cover we added a base layer to the box stencil which will make it easier for you to use. Full instructions and colour suggestions come with the stencil. Stencil the two layers of the box in contrasting colours. You should now have a matching pair of 'Foos'. Remove the sticky tape. Decide whether you want to apply a background pattern and if you do you'll need to mask the stencilled image. Select a stencil for the background. I used red paint and tinged it with highlights of the pearl magenta. The stencil was F43-Damask from our stencils for furniture collection. There is quite a choice of small patterns like this one. An alternative background could be JA54-Bamboo stencil or some of our Japanese Style repeating stencils. Stencil over the mask so that you can match the pattern up easily, this design is repeated by placing the stencil over the last line of the previous imprint. I chose to stop the pattern halfway up the cover but if you prefer to fill the whole space then do so. The stencilling is now finished. Remove the tacky paper and save it for the next cushion. Turn the cover inside out and with an iron heated to the appropriate setting for the fabric, heat set the paint and remove the crease marks. Then, stuff a cushion pad into it, stand back, admire your handiwork then go off and stencil some more. You could create a foo family with varied colours and background patterns! My next project with the foo dog stencil will be to decorate matching cabinet doors and my next 'how to stencil a cushion cover' project will feature a pair of stencilled Staffordshire Spaniels or 'Wally Dogs'. The Staffys are another new stencil. Visit again to see the results. I have priced the stencil based on a height of 14.5 inches (368mm) including the base which is 4.5 inches. There is a bigger one at 23 inches tall, perfect for cupboard and cabinet doors....or much larger pillows than the one in my pictures. Custom sizes can be accommodated too. To order the Foo Dogs stencil read the information in the comments section below this post. Also, our contact information is in the 'About' box on this blog and on the 'Contact Us' part of The Stencil Library website. You can always leave comments on the blog or on our Facebook and Instagram pages. French empire style dating from the 1800s is an enduring neoclassical look in architecture, furniture and the decorative arts. I couldn't tell you why it remains popular. It just is. It is a quite formal style that includes elements of classical greek and roman decorative styles. Maybe it is just a style that lends itself particularly well to interiors. Maybe it is a style that we are used to seeing in larger, grander houses (historically speaking), but does translate well to the smaller, more humble home. For whatever reason, it is certainly a timeless style that works in most homes and with all styles of furniture and accessories. This particular repeat, FR12 Hugo, is large, but open so is not a heavy or busy design. We have given it a bit of a rococo or adam treatment by stencilling it in white on a pale coloured background. It is from our new French Inspired stencil range. Hopefully, Josephine would approve of this one. Our damask pattern stencil SIB-20 was created originally for the book Stencil It by Helen Morris. It is a two-layer stencil. Both the overlays can be stencilled in the same colour or provide a contrast by stencilling each layer in a different colour. The SIB20 Damask stencil collection has large and small patterns to choose from. One can elect to order a single damask motif or a repeating grid of pattern. The repeating patterns have an -R in their title. The photos above an below show the large size of the damask stencil. You can order one much bigger than that if you should need it, but I think if you were looking for a huge damask pattern to stencil onto walls and floors our HG1 Large Damask could be a perfect choice. I will put the picture of that one at the end of this post. Here are a few pictures of the smaller version of SIB20 Damask. we have stencilled the wall and bedcover with pearlescent white paint in the following picture, then we stencilled with acrylic gloss varnish for the picture with the garden flamingo then with silver paint for the stencilled denim jacket. The stencilled denim jacket was embellished with crystal. There are inexpensive versions of the crystals at craft and hobby stores. My stash was a gift from Swarovski Crystal and are ultra sparkly. Here is the very large stencil of Damask that I mentioned earlier. You see more information or order the stencils by using the links in this post. Otherwise, go to our stencil-library website and type the word damask into our search box and we should find them all for you. Let's just stick with traditional today. Because sometimes, traditional is quite gorgeous and cannot be bettered. Although you can vary it or modernise it, in some cases, the original treatment is best. If you want a french country look (always popular, always a great theme for interiors), it doesn't get much better than toile (de jouy). However, to be correct, what we know as toile de jouy actually originated in Ireland in the mid 18th c), but quickly moved through Britain and into France and it is the French version that we are most familiar with. Toile ("de jouy" referring to the area it came from) simply means canvas and therefore was the same for this type of fabric and it has stuck. The premise of toile is simple. It is usually a cream coloured background with a repeated pastoral scene over the surface in a single colour. Blue and dark red are the most traditional colours, but other colours have appeared throughout time. Toile has never gone out of style, it is a design classic. But its popularity has waxed and waned throughout the past couple of centuries. Typically it has always been a fabric, but wallpapers have also appeared. And now there are stencils. We have a few different toile stencils and in fact have a toile section in our Vintage range of stencils. But we have added this pattern FR43 Sheep Toile to our new French range of stencils. It is a simple all over repeat pattern and for the traditional toile look, stencil in one colour on an off white background. I know I am not alone in being entranced by the ombré or grades of colour look. This is an effect that has shown up in different mediums for decades, if not centuries. To pick one, I have a sideline vintage clothing business and I can tell you that if ever an ombré frock appears on the scene, it does not matter from which era be it victorian, 1930s or 1950s, it always creates a flurry of excitement. It just looks so different. And it is not that it is difficult to achieve, but it does take work to achieve and that shines through. The same applies to decorating. Graded colourwashed walls always look impressive. Or rather it looks impressive if done properly. It is not easy to achieve the perfect hazy look that deepens as you move down the wall (so if you are going to attempt it, just have a wee practice first). But get it right and your walls will look amazing. You can create and effect using stencils too. It will only work with certain designs and I won't deny it isn't going to take some work, but the result is amazing. You will have truly exceptional walls. This wall was created using our DM4-X Chevron decorating mask from Big & Bold. Other stencils that can be used to create an ombré include MD47 Fade from our Modern Design range, VN31 Marble from our Vintage range of stencils, DE234 Repeat No. 25 from our Art Nouveau range, DE323 Repeat No. 44 from our Art Deco range to name a few. All of these have defined repeats so you can stencil each "row" in a different shade of the same tone going from light to dark or vice versa for a proper ombré effect. With other designs, for example a damask, you can stencil in an ombré effect but like colourwashed walls, you will have to be a bit more skilled about blending the shades of colour from one to the next to get the subtle gradation as there are no defined "bands" within the stencil to do it. It can be done, but have a practice first. This type of effect is more difficult than using a stencil where you simply stencil each band of repeats in a single tone, changing the tone as you move down the wall. Yes, these effects take planning, thought, concentration and work, but the results will always be worth it and special. We often talk about how to make pattern more subtle by using tone on tone. Well this is a slightly different way to approach tone on tone. It is an all over repeat pattern with a slight damask style to it. It is FR10 Grenadine and it is from our new French Inspired range of stencils. We have painted the wall in a mid tone of our chosen colour, a slightly burnt orange. Instead of stencilling in a single tone, either darker or lighter on top, we stencilled in two tones, one lighter and one darker on top. The effect is still subtle. This is not the most inspiring photo/roomset, but it gives you just one idea of what you can achieve with stencils to make your own art. Buying ready stretched canvases is easy (most art shops sell them). Simply paint them a background colour and then apply a stencil. You can do anything. Here we have decided to create a midnight garden by using our large GR70 Parlour Palm from our Garden Room range of stencils. But to make it a bit more "arty" and abstract, we have only stencilled a portion of it. If you want a collection, have three canvasses, each with a different portion of the palm stencil on it. Choosing the tonal colours of a twilight background and deep ink blue stencilling adds to the abstractness (is that a word?). Doing these types of things are fun and personal and a quick way to add some decoration and interest to your walls. This is particularly handy if you rent and are very constricted about what you can do with your walls. And even better, if you are bored with the midnight garden, paint it out and create something else. In other words, you can create art and keep your collection ever changing and fluid.